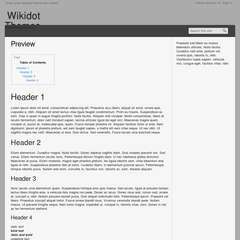 The Goodnight theme once again raises the bar in wikidot theme designs, offering you a simple, practical and bold choice when building your next site. Complete with custom buttons, comments, quote & code blocks and hovertips, the Goodnight theme will be sure to please both yourself and your visitors. December 1, 2010: First release (v1.0). slight change to padding around footer/license area. Changed body color from #333 to #222.
fixed gap between top-bar and content. added padding to #page-options-container & #action-area. On the about page and contact page, some stray text from the code gets inserted into the page at the top: "=About" and "=Contact". If however you are importing the theme using the instructions above then you will need to consider creating a page on your site to hold the CSS import line and your change to the breadcrumbs. This is the most flexible way to manage it and means you can alter any aspect of the way your site looks very easily, with full history, reversion etc. The instructions are doing this are at http://community.wikidot.com/howto:flexible-css-putting-css-on-its-own-page and if you have any problems do ask on the community forum.